Six hundred and fifty thousand miles of driving without a single mishap is the record on which a safety committee headed by Ray Ingels, director of the California Department of Motor Vehicles, declared Mrs. Nell A. Leavitt of San Francisco the State’s safest driver. Mrs. Leavitt is seen here starting in her Dodge sedan for New York City and a national Safety conference once at which she represented California. That was the news copy accompanying the image, transcribed from text pasted on the back of the print. I stumbled onto the photo on eBay, and thought the scene looked like a western San Francisco locale. I was intrigued. The Department of Motor Vehicles used to track the safety of state drivers and award them prizes? The winner selected was a woman? In the 1930s, most women didn’t have motor vehicle licenses, much less drive hundreds of thousands of miles. A quirky story, I thought. So I bought the print, planning to perhaps put it on the back page of SF West History magazine with no more than the short caption that came with the image. 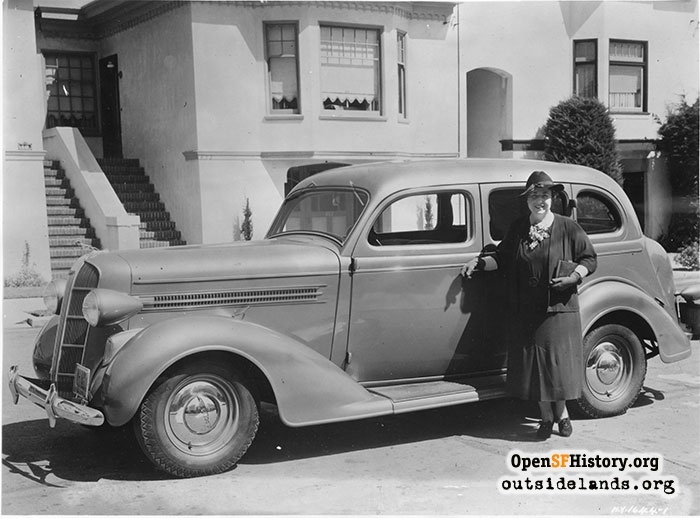 First, I wanted to do a little research to pin down the western San Francisco location, since I assumed Mrs. Nell A. Leavitt was posing in front of her house. Turned out I was right. The photo was taken on the 800 block of 42nd Avenue. But I got much more than I bargained for, discovering an unusually adventurous and independent woman that experienced a terrible tragedy six years before she smiled for a press photographer in front of her Dodge sedan. Nell Anthony was a graduate of Polytechnic High School (the school changed its name from Commercial High School while she was attending in the 1890s). She later said she chose the school specifically because it was the only high school offering commercial subjects. Polytechnic’s mission was to prepare students to enter the trades and the world of work capable in shorthand or cabinetry or accounting or welding. Nell Anthony was a hands-on type of person. Shortly after high school, she married John Wheeler Leavitt, a man who started as a bicycle salesman in 1894 before moving into motorcycles. 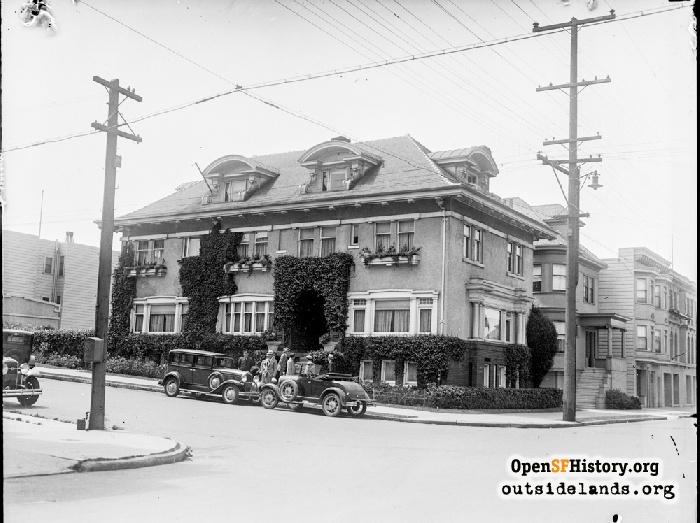 By 1902, had taken on two partners, W. J. Pedlar, and a teenager named Albert D. Plughoff, to run one of the first automobile dealerships in San Francisco. The age of the motorcar had begun. In 1902, alone, fifty new companies formed to manufactured automobiles in the United States. J. W. Leavitt & Co. became one of the country’s largest auto dealerships, and its energetic president became head of the city’s Automobile Dealers’ Association. Leavitt was an adventurous and confident face of automobile ownership and enjoyment when people weren’t quite sure if the new inventions were little more than rich men’s toys. Taking a new roadster or touring car on a three-day ride across California Leavitt would make sure to get a short article in the newspapers about the ease and convenience, touting how well his product could tackle wild country while simultaneously advocating for new and improved public highways. In the days when roads were often rutted, muddy, and impassable in bad weather, when a day of driving could mean two or more flat tires, Leavitt headed for the Sierra Nevada mountains in winter, drove one of the first automobiles into Yosemite, and accompanied a buyer to christen Calaveras County with its first motorcar. He became one of the earliest transcontinental drivers, going to the East Coast multiple times to find new models and drive a sample back to his San Francisco showroom. 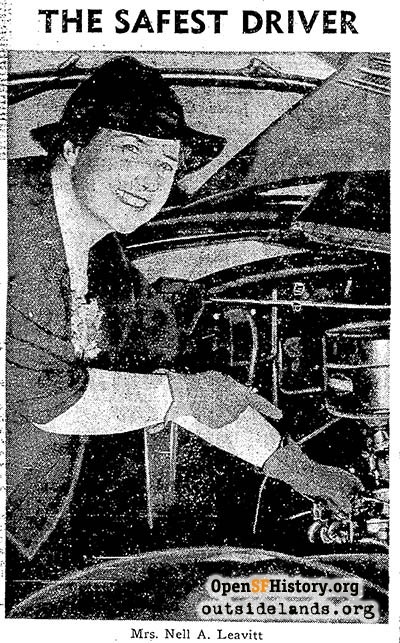 Nell accompanied her husband on most of these publicity jaunts, not only as a passenger, but also as an enthusiastic driver. She knew her way around an engine and a tire change. In 1908, she was called “one of the city’s best known women motorists.” Oh, and along the way she had six children. Selling automobiles had become a very good business by the 1910s and 1920s. In 1902, when Leavitt started his auto dealing, about 23,000 motor vehicles were registered in the United States. In 1929, that number had risen to 23 million. Leavitt and his partner Plughoff, vice president in the firm, prospered. They were great friends outside of business that went on hunting and fishing trips and had neighboring country estates in Belvedere. Both were rumored to be millionaires. 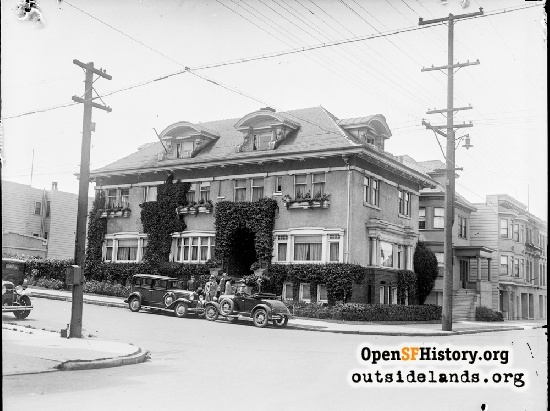 The Leavitt family lived in the Richmond District at 101 20th Avenue, a stately home on the corner of Lake Street. But fortunes fell after the stock market crash of October 24, 1929. As the world slid into what would become known as the Great Depression, Leavitt and his partners found themselves scrambling. Sales plummeted so much in the auto industry that production was halved in 1930. In late July 1930, J. W. Leavitt & Co. had to shut down. Behind the doors of the firm’s showroom and offices at 1414 Van Ness Avenue, the city’s “Auto Row,” the owners made a desperate attempt to reorganize the firm and save it from bankruptcy. Then, in the middle of the negotiations to rescue the company, Plughoff told Leavitt he had accepted a well-paying job from General Motors. The old friend and business partner, whom Leavitt had hired as a 15-year-old to sell bicycles thirty years earlier, said he wanted out. The two began negotiations on a financial settlement for Plughoff’s exit that looked to leave a near-death J. W. Leavitt & Co. $40,000 in the red. On the afternoon of August 11, 1930, employees cleaning up the mostly-emptied showroom heard a muffled report they assumed was a car backfiring. President Leavitt walked slowly out of the building, remarking “Looks like a quiet day in the automobile business.” He drove away. Nell greeted her husband when he arrived home on 20th Avenue. She didn’t notice anything odd in his demeanor. Leavitt went upstairs, still in possession of the borrowed pistol he had used on Plughoff. He wrote two blank checks made out to his wife and stripped off his shirt. When he heard the police arriving outside, he went into his son’s bedroom and shot himself in the head. When Nell filed final accounting of her administration of her late husband’s estate, after the payout by the life insurance policy and the settling of debts, there was a net balance of $13,573.11. Six years later, when Ray Ingels announced the winner of the California State Automobile Association safety campaign contest, Nell A. Leavitt was living at her daughter Dorothy’s house at 847 42nd Avenue. Dorothy had divorced her husband—the man who had lent her father the pistol he used on his partner and himself—three years earlier. The national safety conference and motorcade took place on August 31, 1936. As part of the rules of participating, Leavitt had to drive herself to New York City. She planned to cover 300 miles a day in getting there and visit some East Coast family afterwards. Her 20-year-old son Robert came as a passenger to keep her company. 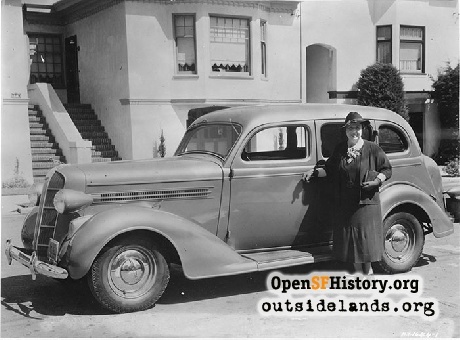 On August 19, she officially launched her trip from City Hall, where Mayor Angelo J. Rossi offered her a personal farewell at the window of her Dodge sedan. She’d owned 21 different makes of car between her first, a 1902 model she described as a “‘one lung’ red roadster, with tiller control and chain drive” and the Dodge, which she praised highly on her return after covering 7,000 miles of the United States. Her time in the limelight didn’t end after the successful conference and cross-country trip. As “California’s No. 1 safe driver,” Nell Leavitt went on in the next few years to speak at luncheons, appear on radio shows, advocate for newsboys to be more visible by wearing white at night, and pose for public service photos checking her oil and getting her windshield cleaned. Nell Leavitt died October 18, 1960. A simple notice in the newspapers listed her as the widow of J. W. Leavitt, named her children, and identified where the funeral service would be held. There was no mention of her onetime title as California’s safest driver. Page launched 30 January 2017.